Jeff Bezos, founder and CEO of Amazon, speaks at the White House in May. AMAZON PLANS TO hire 100,000 full-time workers over the next 18 months, highlighting its ambitious expansion plans. The e-commerce giant’s move is in sharp contrast to traditional brick-and-mortar retailers, many of which are cutting jobs and closing stores. Amazon has long been known for investing the money it makes back into its businesses, and it’s doing that with a vengeance. The new hires will largely support new Amazon fulfillment centres in states such as Texas and California, expanded delivery capabilities and its money-minting Amazon Web Services cloud computing business. The numbers are generally in line with Amazon’s past hiring plans. Amazon, which had a total of 306,800 full-time and part-time employees globally at the end of September, hired a total of 123,700 employees globally during the 15 months to the end of September, according to quarterly filings. Amazon today said its US workforce has grown from 30,000 in 2011 to over 180,000 at the end of 2016. By comparison, Walmart — the world’s largest retailer — employs about 2.4 million people worldwide, including 1.5 million workers in the US. Baird analyst Colin Sebastian said the announcement shows that Amazon’s hiring appears to be accelerating. The news comes a month after President-elect Donald Trump met with tech leaders, including Amazon founder Jeff Bezos. 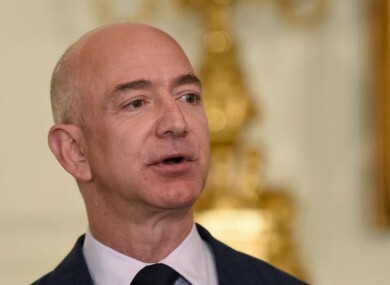 Throughout the presidential election campaign Trump and Bezos clashed after Trump attacked Bezos and The Washington Post, which Bezos owns. But they appeared to make nice when Bezos attended the meeting in December. Sean Spicer, the incoming White House press secretary, noted in a call with reporters today that Amazon made the announcement after the meeting, when Trump urged tech leaders to keep jobs in the US. Spicer said Trump was “pleased to play a role” in the job gains. Amazon did not immediately respond to a request to comment on what role, if any, Trump had in the jobs announcement. Baird’s Sebastian downplayed the politics factor, noting only that the online retailer may have deployed some “political capital” in the timing and details of its announcement. Things are much less rosy at traditional brick-and-mortar retailers in the US. Last week, the Limited said it would close all its stores and Macy’s moved forward with plans to close 68 stores and said it will cut more than 10,000 jobs. There have been unconfirmed reports Walmart is also planning layoffs. “The move from bricks to clicks is causing major disruption in the retail industry,” economist Diane Swonk said. Email “Amazon to create 100,000 full-time jobs in US in next 18 months ”. Feedback on “Amazon to create 100,000 full-time jobs in US in next 18 months ”.